Our family, once upon a time, discovered the World’s Best Coffee and it became part of a much appreciated Christmas tradition. This tradition started when my oldest brother was graduating from law school in D.C. and we’d all piled in the car to go up there. At the end of the weekend, we were going to attend some high church before driving back home. And we stopped at a quaint coffee shop in Alexandria for breakfast before the service. I traveled to the Capital four times while my brother lived there and I’d have to go back through photos (that aren’t digital) to make 100 percent sure my timeline is correct. But what matters is that we fell in love with the place. And their coffee. I remember walking away from the aroma filled building and beautiful old school steam punk looking coffee roaster completely enchanted by the experience. The graduating brother stayed on in D.C. and brought a bag of roasted coffee with him the next time he came home to Atlanta. Then somebody visited and brought some. And this (and scarcity) perpetuated a strong connection between the taste and aroma of this particular coffee and happy time spent with the family. Thinking the supply would dry up when my brother moved back to the ATL, everyone went crazy the very next Christmas when my other brother passed out identical gifts to every one in the family and we started ripping off the wrapping paper to find Misha’s. (They weren’t even officially shipping it back then.) He’s continued that tradition now for years. And we normally brew a pot of it right then. I got the Tanzania and would have offered up my bag. But this year there was only a Keurig. . . and at the end of the day my Christmas kind of felt like it was missing something. 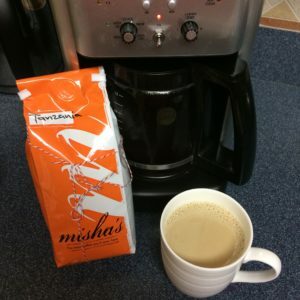 But this morning, the day after Christmas, I’ve ground some of these deliciously roasted beans and savored the aroma wafting through my house even before I took the first sip. And it’s doing it for me. That thing. That feeling. That tradition.